I love baking cupcakes and muffins. When TH gifted me few baking products including this Prestige cupcake tray, I felt my interest over baking cupcakes become an addict. Baking it almost every week and each time I feel as if I am baking cupcakes for the first time and proud of myself after seeing the perfect outcome. I have tried many recipes over web and over a period got to know the basic idea of making cakes/cupcakes. Other than this recipe (which was tried from blueberry boy bait ), I am yet to try my own baking recipe. I don't get time to experiment with baking due to my busy official work and hence simply adapt baking recipes from the blogs I read and prepare them within the limited time I get. Work life balance is difficult part though, I will sure come up with my own baking recipe one day. Fine, I'll come to today's recipe. It is bookmarked almost a year ago from this site along with Rainbow cupcakes. Revisiting old bookmarks helped to prepare few recipes including this one. I halved the recipe but I got nine muffins. It might vary from the brand or quality of the ingredients you use. 1) Preheat the oven to 190C(375F) for 15 minutes. Line the muffin tray with muffin liners and keep it aside. 2) Meanwhile, In a large bowl, mix all purpose flour, oats, baking powder, baking soda and salt. Keep aside. 3) In another bowl, mix vegetable oil, sugar, egg, mashed banana, peanut butter, vanilla essence and buttermilk. 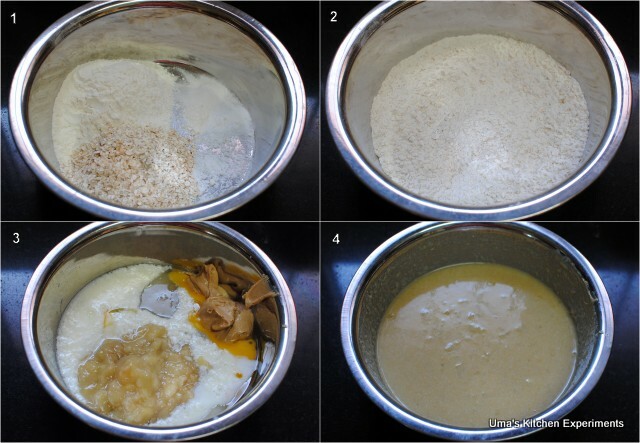 Mix till you get smooth mixture without any lumps and the egg is well incorporated. 4) Mix dry ingredients and wet ingredients. Stir well until you don't find any flour lumps. 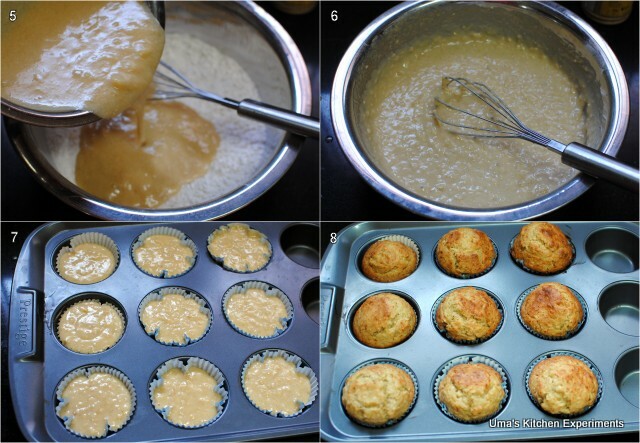 5) Pour the batter equally to all muffin liners. Make sure to fill just up to the top. 6) Bake it for 15-20 minutes or until the tooth pin inserted into it comes out clean. 7) Remove the muffins from the muffin tray immediately and keep them in a wire rack to cool completely. 1) If you don't have buttermilk, mix 1/2 cup of milk and 1/2 tablespoon of lemon juice or white vinegar. Let it site for 5 minutes and substitute it for 1/2 cup of buttermilk. 2) Granulated sugar can be replaced with brown sugar. too soft, moist and delicious muffins...u got the perfect texture...love it! big fan of banana and peanut butter combo..love the texture fabulous clicks..
Spongy and fluffy muffins, love to grab some and have rite now. Uma this looks great! I love bananas in baked goods, and I especially love muffins. I'd love to have a few dozen of these.